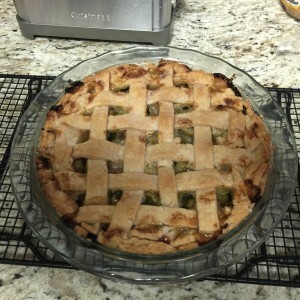 Rhubarb Pie – So Good!! Home made or pre-made pie crust. You can do a solid cover pie crust with air holes in the top or we like a lattice crust, which is actually easier to make (if you have a helper to hold the strips while the next strip is laid). With a lattice crust it is easier to tell when it is done. 3 Cups of rhubarb cut in pieces about ½ inch long. Large Pie Pan (It seems like large pie pans are becoming more common, which are deeper. 4 Cups of rhubarb cut in pieces about ½ inch long. 1)	Lay out the bottom pie crust in the bottom of the pie pan ready to be filled with the ingredients. 2)	Cut the rhubarb in ½ inch pieces, measure, and place one cup at a time evenly in the bottom of the pie pan. Add about a quarter cup of blueberries with each cup of rhubarb. 3)	Mix the sugar and flour in a separate bowl. When it is evenly mixed, spread evenly over the top of the rhubarb. It will filter through the fruit. 4)	Cut the butter pats and lay them over the top of the rhubarb. You can cut the pats in smaller pieces to make it more evenly spread. 5)	Put on the top crust, and “pinch” the edge of the circumference. The old fashioned way to check a “covered” pie crust pie is to “Spit it”. Immediately after you take it out of the oven your helper spits on the tip of their finger. When the tip of the finger touches the center of the bottom of the pie it will “spit”. If it spits, it is done. If not, it needs to bake a little longer at 5 minute intervals. Our water source comes from a garden hose. 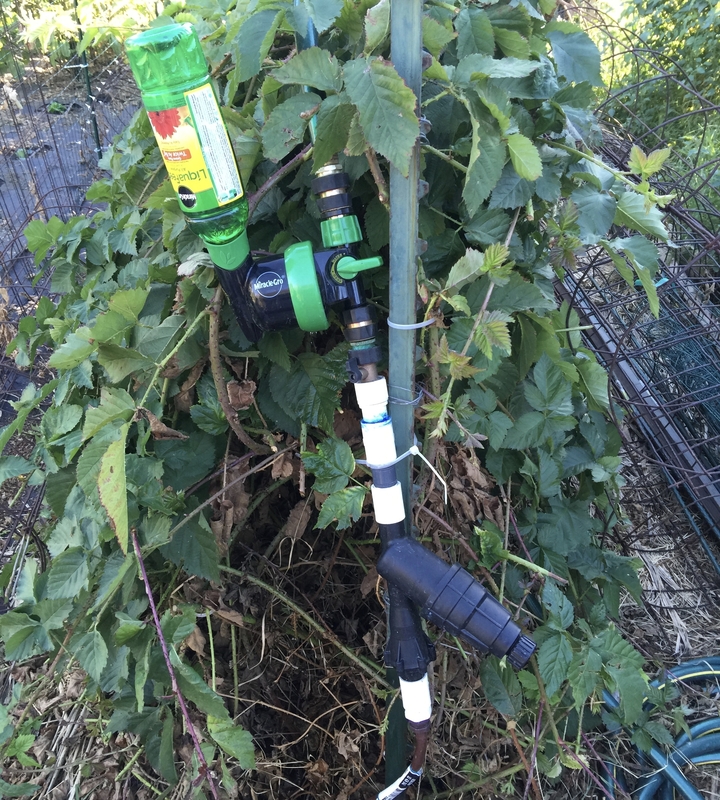 We installed our drip irrigations system, got our plants up and growing and wanted to add some fertilizer to feed our plants. The most efficient system would be to add a liquid fertilizer through the irrigations drip tube a the base of each plant. 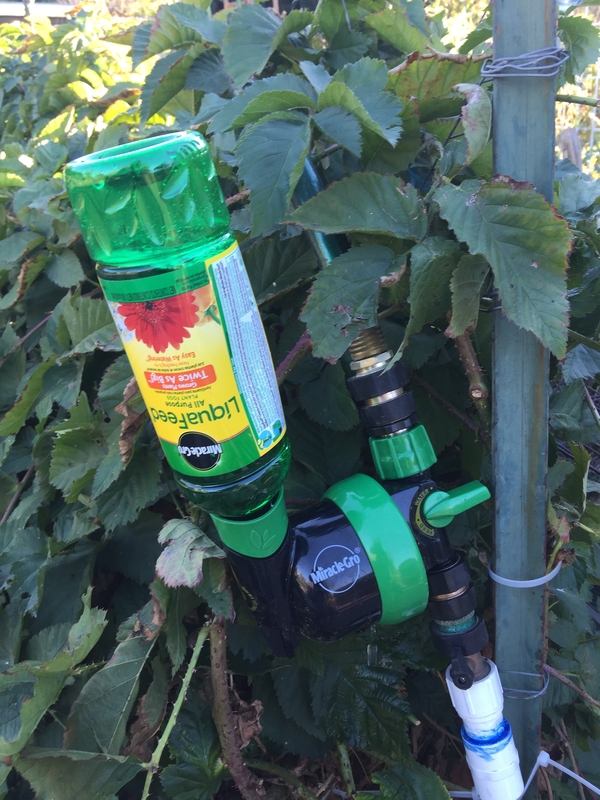 We had seen the Miracle-Gro injector system at Home Depot and wanted to give it a try. 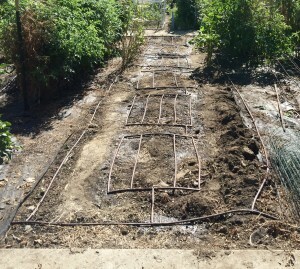 Relative to our investment in the garden and the drip tube system, it made economic sense. In this system you purchase an injector mechanism that can be coupled with a garden hose. We added a a pair of quick couples to each end for and easy on and off. We remove the injector when we are not using it. You must purchase the bottles of fertilizer from Miracle-Gro to be used with this system. Again a little more expense, but the system is a real labor saver and provides a uniform application to all the plants in the system. So, the cost saving is in less potential fertilizer waste when compared with applying manually. The fertilizer bottle is screwed into the injector when the system is running and actively irrigating the garden with the switch turned to “water”. Then the switch is then turned to “feed”. You have a switch choice of “feed”or “water”. Gradually a suction will form and the liquid fertilizer will be slowly sucked into the irrigation system. You can add a whole or partial bottle at a time. When you have finished fertilizing, turn the switch back to water. It is important that you continue to water after fertilizing to get the rest of the liquid fertilizer out of the irrigations system. In our drip system, we let it run at least an additional fifteen minutes. You do not want to let it run so long that it leaches the fertilizer out of the root zone. Take into consideration the length of seedling or new transplant roots compared to the longer roots mature fruit or vegetable plants. In our drip system and virtually all drip systems, it is important that no solid material enters the system and plugs the small emitter openings. To do this we add an inline filter that can be taken apart and cleaned periodically. Additionally we installed a inline pressure reducer which will take high pressure water and reduce the pressure to a level that will not blow apart the hose couplings and allow for a slow steady drip. In our situation our public water pressure is above 80 psi (pounds per square inch) and needs to be reduced. You can buy the pressure reducer and filter as one unit, as pictured, or buy them as separate parts. We also add into our connections a simple on off valve that can be used in an emergency to shut off the water or to regulate the water flow from no flow to maximum flow. The drip system can be adapted for specific planting situations like extra long or short rows, adding emitters for plants that need extra water, or establishing seedling beds for transplanting. After one summer’s use, we are impressed by this little affordable piece of technology and expect to continue to use this system.